We've previously talked about Folder Portals, a really cool feature that makes finding what you need quick and easy. This week, I thought we’d take a look at another new feature: Pages. This is great for people who have a lot of icons on their desktop, or like to keep them super-organized with multiple Fences. 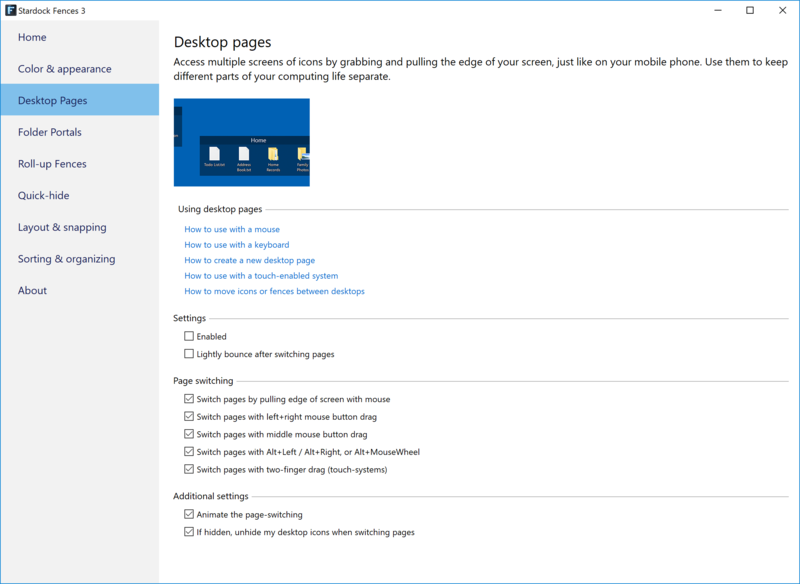 Alternatively, you can configure the pages to switch using the middle mouse button drag, keyboard combos, and a few other methods. To access all of these settings just open up the Fences configuration and select Desktop Pages. Learn more about Fences here. Fences is available individually for your Windows PC, but you can get that and more with a low-cost membership to Object Desktop. While you're a member, you'll get free updates, access to all betas, and any new apps for one year. You’ll also get access to other great programs like Groupy, Start10, DeskScapes, WindowBlinds, Multiplicity, and more! Visit the Object Desktop site for more information. Yes. This does a lot more then I use it for. I have to spend more time with it and try to figure it out more.
? the 3 ribbons. Ex. Work- downloads. Are they rolled up fences or can you just click on a ribbon and it open that folder? Higher education? If you got the bucks.